It’s a common dilemma when online shopping and something that can be avoided with just a few handy tips on how you can work out the best clothes for your body type. In this article, we go over what body types there are, how you can figure out your body type and what styles work best for you to flaunt your figure. There are varying degrees to every body type, but the majority can be placed into the 5 most common body types regardless of weight or height. The main focus of these body types is your body proportions and balance, later using these guides to work out how to create a balanced overall look in an outfit. A small top half as well as a small bust. Now that you’ve figured out what body type you are, find out how to dress for it! As an Hourglass shape, your bust and hips are well balanced, you have a defined waist and have gently rounded shoulders. You most likely have a rounded bottom. Your upper body is proportionate in length to your legs which are shapely. Dresses that cinch at the waist will be your best fit. V-necks or plunge necklines and sweetheart necklines help you flaunt your upper body. To show off your waistline, go with a belt at your natural waistline or just below the belly button. A-line dresses or similar cuts take care of working on the lower part of the body and of course, body-hugging dresses are your thing, because, why not? Avoid too many frills on your clothes as they will add extra bulk to places where you don’t need it. Be careful when choosing casual clothes as they can make you look boxy. As an Apple shape, you have chest and waist measurements that are fairly close, but your hips are about six inches smaller than your chests. Your shoulders and hips are around the same size. Find clothes that suit your body type by looking to a-line or empire cut blouses and dresses. Wear printed dresses or patterned jackets that add a layer to shift the focus. Monochrome looks, dark colors, full or 3/4th sleeves dresses and flowy tops will help. You could also wear flared bottoms; palazzos etc. to create a balance. Also, since your shoulders are broad and you might already have a bigger bustline, ensure you wear the right bra. Avoid figure-hugging dresses or tops with skinny jeans. Try and replace the waist belt with an upper waist belt to strike a balance. As a Pear shape, your hips are larger than your bust. You have a nicely defined waist, and elegant neck and proportionately slim arms and shoulders. Your hips are wider than your shoulders. They are also wider than your hips, making them the widest area of your body. Find clothes that suit your body type by looking to wide legged pants, A-line skirts or dresses with patterned or ruffled tops that add definition to the upper body. Skinny jeans with loose tops help create an hourglass illusion and high waist jeans show off the smallest part of your waist. Crop tops, sweetheart, v-necks, scoop or boat necks will balance your bottom out. Avoid clothes that draw your eye to the hips, this includes low waisted trousers, drop-waist dresses, and jackets that hit at the hip. As an Inverted Triangle, your shoulders are wider than your hips. They are the widest part of your body. Your bottom is rather flat. Whereas your bust is a variable part of the equation. Since your hips are much narrower than your shoulders, pencil skirts or skinny jeans with any top will look great. V-neck lines work well and create an illusion of narrow shoulders, so this should be your go-to neckline. Avoid heavy detailing like buttons or epaulets around your shoulders as well as puffy sleeves, these draw the eye outward and make you appear top-heavy. Horizontal stripes also have a similar effect, instead, go for vertical pinstripes. As a Rectangle shape, your shoulders, waistline, bust, and hips are around the same size. Rectangles have well-proportioned bodies, lean limbs, straight waist and small chest make them look like athletes without even trying. Choose A-line skirts with ruffled and layered tops. Dresses that add definition to your bottom and necklines that add weight to the upper body. Sleeveless, strapless and sweetheart lines are your thing. Blazers, long jackets and capes add the much-needed drama here. Avoid shapeless clothes. If you want to add curves then avoid straight dresses, but you can also opt for the waistless look! Keep the volume on either the top or the bottom. If you go for an oversized top shape, keep the bottom skinny or structured. The more you know about your body shape, the better you can dress for your specific body type. Try experimenting yourself and see if these tips are useful to you, see how your confidence can improve just by making a few minor changes in your styling. Did you find this useful? Let us help style you and your body type! 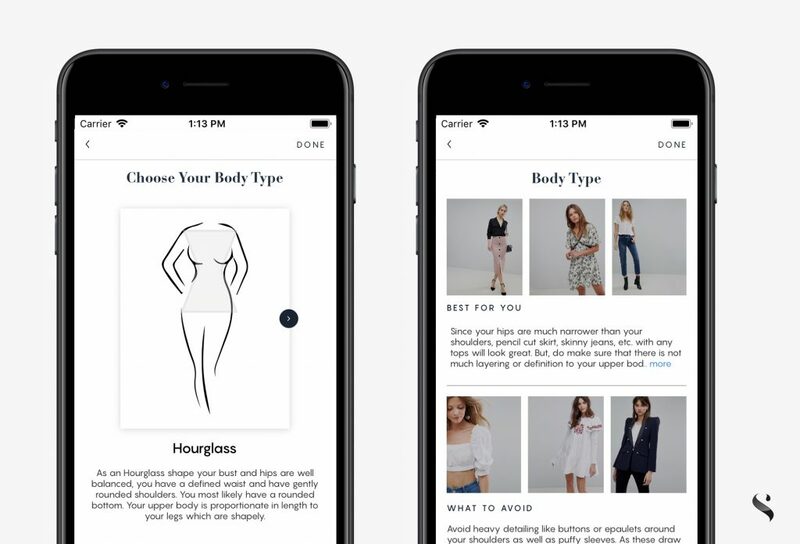 Download the app, snap a photo of an item you are wanting to style and see recommendations from your existing wardrobe or new from retailers all personalized to your body type.